I originally received a copy of Mãn by Canadian novelist Kim Thúy in ebook format from its Canadian publisher Random House Canada via Netgalley but I was never able to fully immerse myself into the text because there seemed to be some formatting issues that distracted me enough to put it down after trying to read it for the first time. However, when I came across the book on the shelves of Chapters (before its release date!) and flipped through the first few pages, I was immediately drawn into the story and fully understood why the formatting issues existed (more on that later). I decided that the ebook version wasn’t for me and, because of the strength of the first few pages, decided to buy the finished copy of the book. I was not disappointed. Mãn – meaning “perfect fulfillment” – is a novel about a Vietnamese woman named Mãn who is raised in Vietnam. 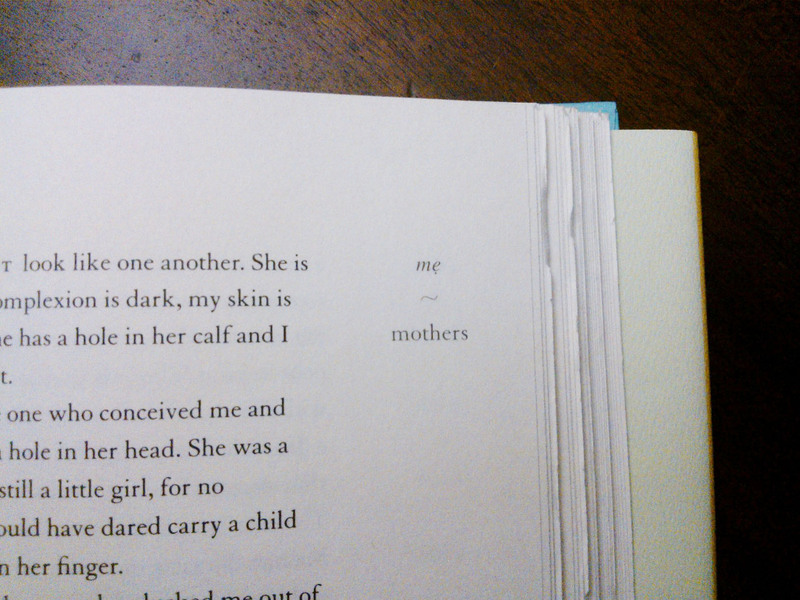 Mãn was raised by her Maman, who, we learn in the first few pages, is not her birth mother. Nevertheless, Mãn and her Maman have a deep bond built on love, respect, and the enjoyment of creating traditional Vietnamese dishes together. When Maman sets Mãn up with a Vietnamese man living in Montreal, Mãn finds herself feeling lonely in a loveless but dutiful marriage in a foreign place. Luckily, she finds happiness in her job as a chef at her husband’s restaurant, finding fulfillment in her customers’ delight over her traditional Vietnamese dishes rather than at home. But is this little bit of happiness enough? What will happen when Mãn finally meets someone who ignites a passion in her that she never knew she had? At less than 150 pages, Mãn packs an emotional and affecting punch. It is equally interested in its plot as it is its characters’ heritage, history, and feelings, and its poetic tone really allows this to shine. Beautiful is the only word I can think of to describe the descriptions and musings in the novel and even then I don’t think I’m doing it justice. Similar to Haruki Murakami’s Colorless Tsukuru Tazaki and His Years of Pilgrimage, Mãn‘s quiet and unassuming tone is hard to describe. If you are a fan of introspective novels, I would suggest giving this book a try and see for yourself what I mean when I say I got swept away by the beautiful passages and allusions to Vietnamese poetry and tales. As a chef who was taught how to cook “…in hushed tones, whispering so that neighbours couldn’t steal recipes,” Mãn’s relationship with food is filled with intent and emotion, especially when she recreates traditional Vietnamese dishes in Canada. Her descriptions of food throughout the book are extremely exquisite and really emphasize a harmonious relationship with food, reminding us that food isn’t only for sustenance but also for admiring, a way to share love with one another and ourselves. Food also carries a lot of historical weight as many traditional dishes are created using local ingredients filled with historical background and purpose. For foodies who love reading gorgeous descriptions of food in books, Mãn will surely delight. As for me, it has reminded me that food should be consumed and prepared with intention, and I’ve decided to be a little more thoughtful and appreciative of my meals rather than scarfing down my food as quickly as I can. Contributing to the overall tone of the book is the aforementioned layout of the book, the source of my ebook formatting issues. In the margins on the novel are Vietnamese to English translations of words and phrases that correspond with each chapter’s subject matter. Not only does this allow readers to appreciate the two languages, it also brings together the two cultures, just as Mãn did when she moved from Vietnam to Canada. These marginal notes add an aesthetic and thematic edge to an already delightful book. I still have so much I could say about this short book and I think this fact really demonstrates Thúy’s talent. This small book is filled with wonderful descriptions, thoughts, and ideas that never feel jumbled or rushed. There are multiple layers of the story that can be dissected and admired though it can also be read quickly in a few sittings. I would have loved to have read this as a book club book and I can’t wait to read more reviews of this novel so I can discuss it! If you are going to check out the book (and I highly recommend that you do), I would suggest going for a physical copy over an ebook just in case the formatting is the same as it was for me. Plus, the book has a beautiful pastel blue colour under the dust jacket that makes the whole book so aesthetically pleasing that I’m glad I have it for my shelf. I will proudly display, recommend, and lend out this tiny book for years to come. Verdict: A book that I thoroughly enjoyed for so many different reasons. From its perspective on food, family, duty, and love to its beautiful cover and page design, there is really something for pretty much everyone in this novel. The bonus for busy readers is that it’s a short novel that pays off in big ways. Read if: You love reading about different cultures (in this case Vietnamese and Canadian), enjoy reading wonderful descriptions of food, want to read something that’s short but also intelligent and thought-provoking. I would highly, highly recommend giving it a try. I loved this book as well, it sort of crept up on me as I read it and I found I had to keep going and read it in one sitting. You can’t just stop and come back to it, it’s quietly consuming. I hadn’t heard of this book before, but it sounds really lovely. I love reading about different cultures, and nothing beats good food writing. Thanks for sharing this! You’re welcome! I’m glad I got you intrigued 😉 I think this book is especially interesting as it deals with being an immigrant – how do you retain your sense of belonging/nationality while in a different country that is now considered “yours”? I think this book will speak to a lot of people and I definitely felt touched by it. This sounds so good! The writing seems beautiful and I love reading about different cultures. It really is. I hope you get a chance to read it! Beautiful review! And I love multicultural stories, plus it seems Canadian authors are excellent at writing those. Thanks for introducing me to Màn. You’re welcome 🙂 Perhaps Canadian authors are great at writing these stories because we’re such a diverse country? There are just so many perspectives to show and I’m glad that I got to read this one! 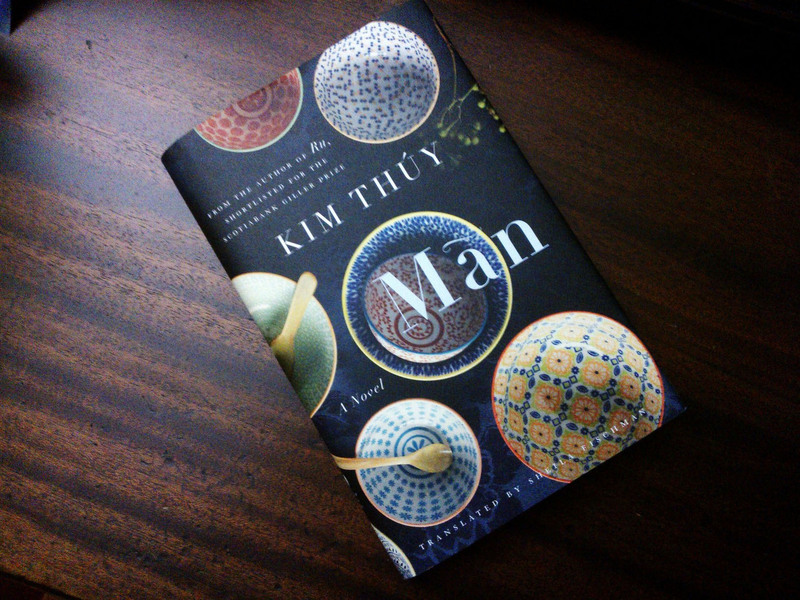 I was surprised by how much I enjoyed this book and think I will have to try reading Kim Thuy’s other book, Ru. I did the same as you! Got the ebook on NetGalley, couldn’t read it, rushed out to Chapters and bought the hardcover on release day. I’m really taking my time with the story. So few words but there’s so much there. I will come back and read the rest of your review once I’m done! I can’t wait to hear what you think! It’s too bad about the ebook formatting but it makes sense once you’ve seen the physical pages. I’m glad you’re enjoying the story. I totally agree with you that it seems to be able to say so much with so little! What a great review of this book! I loved it too, but had a hard time putting into words what I loved so much. Quotes are good for that, because they speak for themselves. 🙂 I am also interested in reading Ru now that I’ve read this one! Yes, I find that with books like this, quotes are so useful! Sometimes my words really can’t do an author’s (and translator’s) words justice. Let me know what you think of Ru if you check it out – I’m hoping to get to it at some point but I have so much on my list that I think it will have to wait!